Large Backlit LCD Display, display all measurements including date and time on the same screen. 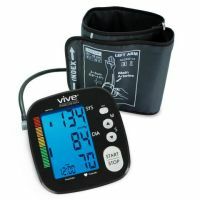 Display Digital Blue LCD display, 2.4" x 1.6"
To Recieve updates and possible rewards for Vive Precision USA Digital Blood Pressure Monitor Silver please sign in. To Recieve updates and possible rewards for BP Monitor please sign in.